There’s always a risk when a classic rock artist comes back out of the woodworks and releases “their first album in [x] years.” There’s even more risk when you have to change your name because of legal troubles. So on paper, Jeff Lynne’s ELO’s new album, “Alone in the Universe,” shouldn’t have a purpose. And maybe it doesn’t. But it’s better than it deserves to be. The name ‘Jeff Lynne’s ELO’ serves a dual meaning. As part of a court deal, it lets audiences know that it’s the Jeff Lynne version, the only constant member in the band’s run (and not ELO II, a different off-shoot). But it’s also billed as such because between songwriting and instrumentation, Jeff Lynne is credited with “everything except the shaker and the tambourine.” He plays all instruments here, and it’s really not ELO. There’s no O and hardly any E or L. It is, for all intents and purposes, a Jeff Lynne solo album. That said, it’s also a victory lap for Lynne. Lynne, and ELO, had a substantially longer and more packed career than people expected them to. Their Greatest Hits discs are loaded start to finish with rock radio perennials. And after everything, ELO ended up marred by legal battles, so Lynne deserves something like this. There’s a discord on this release, and it’s what makes the record better than expected. ELO always had a self-competing sound: they had the space-y ambition and imagery of Boston and Pink Floyd, but coupled it with brilliant, simple pop songwriting. It hardly makes sense on any song, nonetheless many excellent albums. This record embraces that discord – two competing song titles, “When The Night Comes” and “The Sun Will Shine On You” sit back to back. And the second track, “Love and Rain,” sits on the line, “Love and rain keep coming back again.” Likewise, this album is one that sounds nothing like any other ELO album and is a major outlier in their catalog, yet is Lynne’s victory lap for such a successful run. Just like their other music – it doesn’t make sense only because it does make sense. The fact that this album, pleasant and reflective (if not largely immemorable), works at all is a testament to Lynne’s songwriting. Each track is a simple, often quite optimistic rock song. Lynne’s experience with the Traveling Wilburys is strong on the album, especially on “I’m Leaving You,” where Lynne’s vocal rhythm mirrors Roy Orbison’s “In Dreams.” The songs are much more grounded than anything in regular-ELO, and there’s really no song that is better or worse than any other one. The title track (and finale) is a great piece of meta-commentary, with Lynne now the sole member in a band whose numbers have fluctuated past six. Lynne proves to us that no matter what happens, he’ll always be able to write a damn good pop song. None of the songs on this album are particularly great, and none of them will stand the test of time with “Mr. Blue Sky” and “Rockaria!,” but they don’t need to. Lynne feels comfortable in this new form. This album sounds like it was recorded as much for him as it was for us – to prove to himself that he can do just fine by himself. 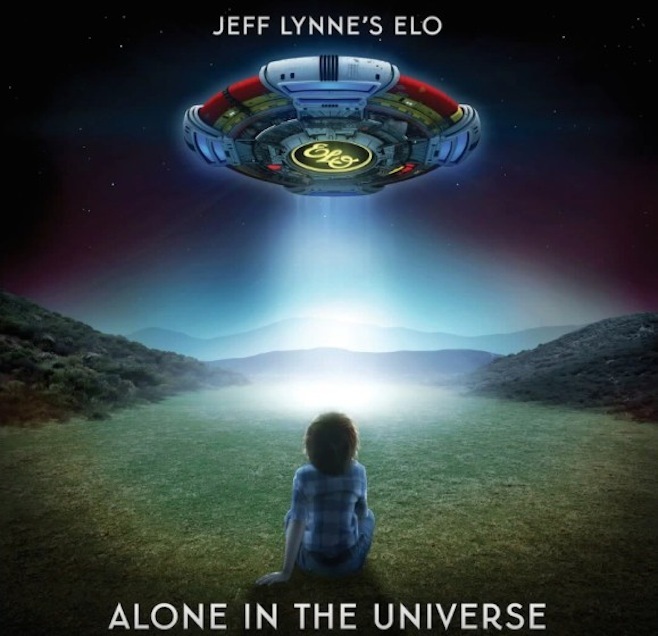 “Alone in the Universe” isn’t going to shatter anyone’s foundations, but it’s a nice addition to the ELO catalog, and a late-stage classic rock album superior to most of what has been done by Lynne’s peers. Lynne has announced that he’s still here, and Jeff, as long as you are, we are too.